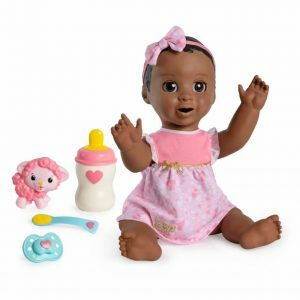 The Luvabeau doll is exclusive to Toys “R” Us which makes it very hard to find, due to the amount of dolls that are being made. Many people are searching far and wide for this rare doll in order to get one in time for Christmas 2017. Right now your best bet is to keep an eye on Ebay listings to see if one becomes available. Many children are already finding so many real baby surprises with Luvabeau! From the second he opens his eyes and laughs, Luvabeau will amaze you with his realistic facial expressions! He moves, talks and plays just like a real child. Through touch and play he affectionately responds to you! Cover his eyes for a game of peek-a-boo, tickle his tummy and toes to make him giggle or place a hand on his chest to gently listen to his heart beating. You can even hold his feet to hear him say “mama” or “dada” and begin to babble! The more you play with him, the more he’ll learn and be able to talk! His babble will transform into over 100 clear words and phrases! Caring for Luvabeau is fun with his four interactive accessories including a spoon, bottle, soother, and Lamby toy. 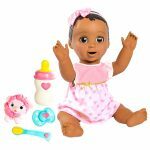 This Luvabeau doll requires four C batteries which are NOT included, so you’ll need to buy some as well or this doll won’t work out of the box! 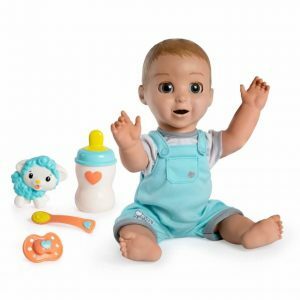 Find more Spinmaster dolls here. 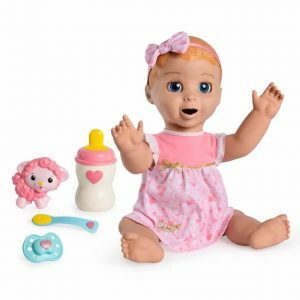 I Purchased the doll for my daughter for Christmas. The doll has not spoke any words yet. It just makes cooing noises. I have followed all instructions it came with. Would that be considered a malfunction? Or do I need to return the product? Purchased at ToysRUs this afternoon and he already lost an entire eyes eyelashes – now one eye has them and the other does not. My 6 year old has been wanting since seeing an ad shortly after Christmas. My other complaint right after unboxing was the $100 doll did NOT come with batteries. I’m VERY disappointed!